LINCOLN, NE – Tennis champions John McEnroe, Andy Roddick, Jim Courier and James Blake will compete in the “Champions Cup Presented by Woods Park Tennis” Wednesday, April 1 at the Pinnacle Bank Arena in Lincoln, Nebraska, as part of the 2015 PowerShares Series champions tennis circuit. The Lincoln event is presented by Woods Park Tennis Center campaign, which is raising $5,6 million to replace the indoor bubbles and make other improvements at the public tennis center located at 33rd and J Streets in Lincoln. “We’re thrilled to bring championship tennis to Lincoln. This is a fun way for us to create greater awareness for tennis and the need to improve our public facilities. And everyone can benefit for learning the game,” said Marg Lincoln Donlan, campaign leader and long-time tennis advocate. The one-night event begins at 7 p.m. and will feature two one-set semifinal matches, followed by a one-set championship match. Individual tickets and unique VIP fan packages are available. VIP packages includes Play with the Pros, Player Party, Backstage and Ball Kids experiences and opportunities to meet the players, get autographs and photos. Lincoln is one of 12 cities selected for The PowerShares Series, which runs March 24 to May 2. Other host cities are: Salt Lake City, Utah; Los Angeles, Calif.; Chicago, Ill.; Austin, Texas; Little Rock, Ark. ; Dallas, Texas; Boston, Mass. ; Richmond, Va.; Minneapolis, Minn.; Cincinnati, Ohio; and Vancouver, Canada. McEnroe won seven majors singles titles in his career along with 10 other majors in doubles and mixed doubles. He won the U.S. Open four times and Wimbledon three times and helped the United States to the Davis Cup title five times. He captured 77 carer singles titles and 78 career doubles titles on the ATP. tour. He has continued his fine play on the Champion’s Tour, winning numerous champions events around the world since his final full-time year on the ATP Tour in 1992, including the points title on last year’s PowerShares Series. He was inducted into the International Tennis Hall of Fame in 1999. 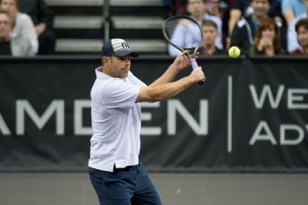 Nebraska native Roddick was the top American man in professional tennis over the last 10 years, winning the 2003 U.S. Open while also posting runner-up finishes at Wimbledon in 2004, 2005 and 2009. He achieved the world No. 1 ranking in 2003 and guided the United States to the Davis Cup title in 2007 – the first championship for the U.S. in 12 years. He concluded his sure-to-be Hall of Fame career at the 2012 U.S. Open. Courier won a pair of French and Australian Open singles titles in the early 1990s when he became the first American to reach the No. 1 ranking since McEnroe in 1985. Courier was also the youngest player to reach all four major singles finals in a career when he reached the Wimbledon final in 1993 at age 22. He also guided the U.S. to Davis Cup titles in 1992 and 1995 and currently serves as the U.S. team captain. Courier was inducted into the International Tennis Hall of Fame in 2005. Blake ended his 14-year ATP career that saw him win 10 singles titles and reach a career high ranking of No. 4, at the 2013 U.S. Open. Blake is best known for playing singles for the U.S. Davis Cup team in helping the United States win the 2007 title – the firstwin the 2007 title – the first win for a U.S. team since 1995. Last year, he finished No. 2 on the PowerShares Series rankings behind John McEnroe. Ticket Information: WOODS promo code!